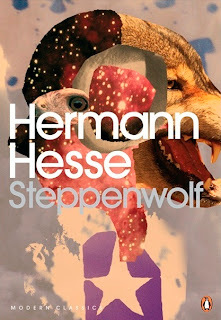 Of all the Hesse novels that I have in my possession, Steppenwolf was the one that I was most looking forward to reading. It was the first novel that I ever really associated with Hesse as a figure in my mind, and for me the psychological aspect was one of the more interesting that I had heard. So the only question remaining is whether it lived up to my expectations. Steppenwolf is the story of Harry Haller, a seemingly normal intellectual living in 1920s Germany. In reality he is a mess of a man, almost crippled by gout and the beginnings of old age, and alienated from the rest of bourgeois society by his personal neurosis. This neurosis takes the form, initially anyway, of the Steppenwolf, a man harbouring the souls of a man, representing higher thought and reasoning, and a wolf, representing physical urges, that are in near constant opposition. Wishing to end his life, he reluctantly begins a journey of self-discovery that promises to cause as many fresh joys and miseries as it assuages. By the end, it reaches the point where you're never quite sure what is real and what isn't. I loved this book. As I've mentioned before, I love a good character study, and this one is probably the most in-depth, scathing and sympathetic portrait of a man that I have ever seen, if a little slow to begin with. Steppenwolf is one of those books that I would urge everyone to read at least once in their lives, as there is something there for everyone regardless of age, gender or race. For me, it strikes a chord with Harry's belief that he is destined for greater things, but the feeling that those greater things are no longer applicable in the world that he lives in; I think that everyone at some point has dreamed of being special, not just to the people you care about, but special in such a way that the whole world sits up and takes notice. At the same time, I think that everyone has had to deal with the realisation that most of the time dreams and destiny don't intermingle, and had to deal with that in their own way; Harry's problem is that he's still stuck at the stage where he's despairing for lost dreams, and so the novel is a journey for him to learn how to live in such a way that he can find satisfaction and harmony within himself. Well, that's how it seemed to me; I think if I read this again several years from now, my opinion would have altered. Next review: Night by Elie Wiesel.